May 21, 2009, 7:48 PM · Can we change the future? That seems to be one of the dominant questions posed by the seriously-confused timeline of the Terminator films. Today at Magic Mountain, Six Flags debuted Terminator Salvation: The Ride, which might as well ask the question: Can one ride help change Six Flags' future, as well? With Terminator Salvation, Magic Mountain offers a cheeky, self-referential attraction that, frankly, reminds me more of what I'd find in a Universal Studios theme park than anything Six Flags has offered in the past. The queue starts in typical Six Flags fashion, with a back-and-forth queue on a concrete slab. But the queue soon moves inside the GCI wooden coaster's track, eventually leading into a - gasp!- themed preshow theater. Like last year's Dark Knight Coaster from Six Flags (which did Magic Mountain did not install), Terminator Salvation's preshow features a cross-over appearance by stars from the film. Moon Bloodgood and rapper Common set up the story behind the ride: We're pinned down by "The Machines" that are fighting to exterminate the human race. The twist? (And I'm gonna totally spoil this...) Common asks Bloodgood for her location, and she reports... "West of the 5, just north of Valencia." That's right, she's trapped at Magic Mountain. The camera pulls back, and we see her outside the coaster, yards from where we stand. It's a post-apocalyptic, bomb-blasted Magic Mountain (the Terminator timeline merges with Fox-TV's 24? ), ground zero in the war between man and machine. For a theme park that aspires to family-friendliness by rising beyond a past too closely tied to offering simply the biggest and baddest twisted metal on the planet, the irony doesn't simply drip off the screen... it floods. "Magic Mountain," Common exclaims, "that place has changed hands lots of times." Okay, I know he's supposed to be talking about the battle between the humans and the machines, but it's a great, self-deprecating corporate joke nevertheless. Anyway, the machines are closing in, and the only way to get past them is... to ride the coaster train to safety. I fear that most riders will just enjoy the cool dark of the room, then keep talking with their buddies, drowning out the preshow narrative. That'd be a shame, because Terminator Salvation's preshow is the most cleverly ironic I've yet seen. 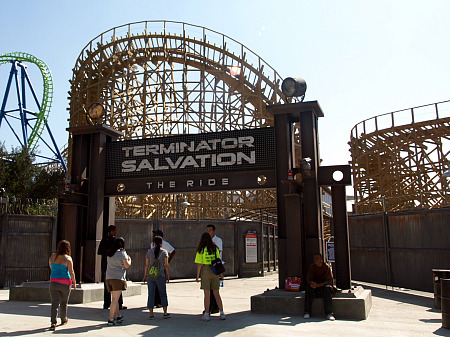 As for the ride itself, Terminator Salvation is much the same GCI model as the beloved Thunderhead at Dollywood. A 100-foot lift hill drops us into a series of lightning-fast, yet graceful, turns, highlighted by a station-shuddering fly-through and a couple of cooling mist tunnels, well welcomed in the Valencia heat. Terminator Salvation's Achilles' heel will be rider capacity. With two 22-person trains on the track, and about a cycle time just under four minutes, we're looking at approximately 600-800 riders per hour. Okay for a wooden coaster, but not great for a theme park trying to keep wait times under an hour. Put this ride at Universal Studios, surrounded by high-capacity, people-absorbing attractions to take the pressure off, and Terminator Salvation would be a certain hit. But at Magic Mountain, I fear that massive initial waits will lead too many thrill-seeking fans to dismiss this coaster. No, I wouldn't wait more than an hour for it, either. 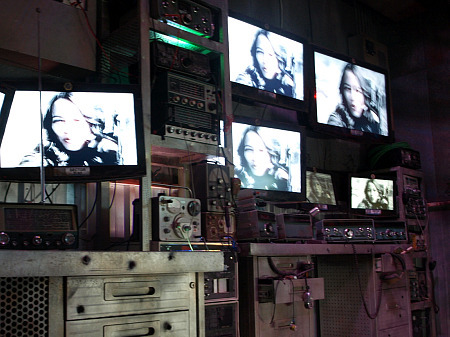 But Terminator Salvation's already become my favorite ride at Magic Mountain. Filled with giddy fun and smart story-telling, this is a ride not for a thrill junkie, but for a theme park fan. 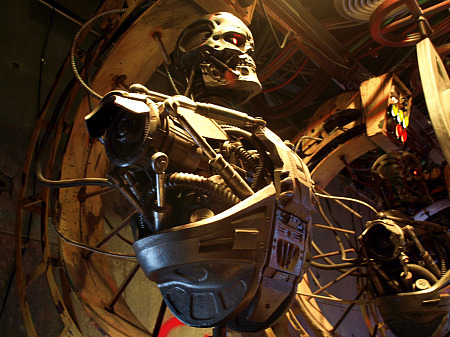 As appropriate for a Terminator-themed attraction, let me say this: It's about time. May 21, 2009 at 7:55 PM · lol, love it. Woodies scare the hell out of me, but I so go on it! Good review though! I see that Six Flags is trying to do some theming and preshow thing for their new roller coasters. Do I see a new dawning in Roller Coasters? If thats the case, Disney would be ahead, followed by Universal, then Six Flags, THEN Busch?!?!?! WOW, maybe thats an unfair assesment. May 21, 2009 at 9:47 PM · lol @ Anthony, SOrry, but your comment made me giggle!! May 21, 2009 at 10:00 PM · Every experience I've had on woodies, regardless of the park, has been a bad one. I feel like I've been beaten with a baseball bat. That being said, Terminator doesn't look like a rough woodie at all. Maybe one day if we get back down to California, I'll take another stab at it. May 21, 2009 at 11:09 PM · We're probably going on Saturday - my boys said they would wait in line just for that one! We'll try to get there early, before it gets too hot to wait in line. Every report we've seen already has looked great. Should be really good. Robert, great job! I wish the camera had been on the track, but it was fun to see your reactions, and the reactions of the park president as he was beaming like a school boy with a brand new favorite toy. Nothing's official yet, but I hope to be in CA sometime after DCA finishes Cars Land (2011 - 2012?)... and that means a stop at Magic Mountain as well. By then, the park very well could be the new Coaster Capital Of The World. Cedar Point best get busy...! I am not sure how the night time lighting is in the park or on the new (dare I say it?) attraction, but if Six Flags left the track mostly dark, then the night ride should be even better than what you experienced in the video. Let us know if you get a chance to visit the Terminator at night, and how that ride compares to your day time event. Also, the ride should get even faster with more use - at least that's what happened to the new GCI coaster (Prowler) at my home park (Worlds of Fun). When I visited the park a few weeks after the preview event, the ride was much faster. Perhaps there is a break in period for wooden coasters? One other note: the lines at Prowler have been managed extremely well as far as riders per hour (there is no preshow, however). It seems to be the fastest moving line at the park these days, so with some efficient line management, Six Flags can make Terminator successful, they just have to put forth a little effort, even with a pre-show. May 22, 2009 at 6:01 AM · Looks like a really fun ride based on your expressions. Seemed to keep moving with lots of twists and turns. THanks for the review and video! May 22, 2009 at 6:38 AM · Anyone find it weird that a ride about futuristic robots is a wooden roller coaster? I'd think with all the metal in the series that this one should have been metal too. May 22, 2009 at 6:51 AM · Terminator Salvation looks like a hot new ride. Man I love those old wooden coasters. Looks like you were hanging on for dear life. What a blast! May 22, 2009 at 8:42 AM · Anonymous Poster 96.57.161.194, I think the idea of the ride is man vs metal, with the soft, pliable wood representing the less technologically advanced human race. So, from the perspective of nature vs science, wood vs metal makes more sense. Nevertheless, this definitely looks a step in the right direction. A little bit of theming never hurt any ride...except Superstar Limo that is. While I agree that all the newer GCI woodies are extremely smooth, the older ones can be very bumpy. Ghostrider at Knott's is still the roughest wooden coaster I have ever been on, and I have the Cyclone in my backyard. May 22, 2009 at 11:32 AM · I guess every coaster needs upkeep or it starts to get rough. Even GCI coasters are not impervious to normal wear and tear. Ghostrider is smooth compared to a couple of Six Flags I've experienced: The appropriately named "Rattler" at Six Flags Fiesta Texas [which was reprofiled four times in the first four years it was around and it never got better] and "The Boss" at the near-to-me Six Flags St. Louis. The last time I rode it I was praying for it to end I was in such pain. Of course any wood coaster not maintained will get bad ("Timberwolf" at Worlds of Fun needs some TLC - although I've not been there this year). But even a woodie that goes sour can be brought back to live with proper work. The aforementioned Six Flags St. Louis has done a great taking the 33 year old "Screamin' Eagle" from a great debut, to a long ever-worse decline, to a great ride once again. And the coaster removed at Magic Mountain (Psyclone - the only wood coaster designed by Bolliger and Mabillard) to make room for Terminator Salvation - well it appears that is a swap that is a breath of fresh air. May 22, 2009 at 12:43 PM · is the actual coaster themed at all? May 22, 2009 at 12:46 PM · Just an on-ride soundtrack. The tunnels and station fly-through have mist effects, but the station mist was turned off yesterday, due to the media day cameras. May 22, 2009 at 2:42 PM · Todd, Timber Wolf got some TLC, but in the process it has been slowed down so much that it barely makes it around the helix at the end of the ride. Honestly, Timber Wolf may be about ready for the scrap heap. And I agree with you completely on The Boss... however, Screamin' Eagle had me screamin' all right... just not screams of joy. If they have improved it, that improvement had to have happened since October of last year. May 22, 2009 at 1:47 PM · Thanks for the info, Todd. You definitely mentioned some real head-bangers. However, Ghostrider is still the only ride I have ever been on that left me with a massive headache for most of the rest of my day at a park. That happened on my first and last time on it in 1999. So, it was still a new coaster. Agree completely on Psyclone. It will not be missed. Terminator looks like it will make a great partner with the terrific Colossus. May 22, 2009 at 5:33 PM · Does anyone else think the SFMM president looked like he was on Wheel of Fortune clapping for "big money?" The Rattler and Psyclone were the absolute roughest, most painful woodies I have ever ridden. If this thing is truly like Thunderhead at Dollywood, then it's a brilliant coaster. Thunderhead is awesome in the dark as it is not lit at all. It's a journey through the blackness of the Smokey Mountains. Therefore, Terminator should be awesome in the dark as well. I'll be there in October, ready to ride! May 22, 2009 at 10:24 PM · I was just at Magic Mountain a couple of weeks ago and this coaster didn't look anywhere near finished. There was no preshow area, outside queue area, or loading station. There were even areas where there was no track what so ever! How did they get this thing up and running with so little time left? I am sure there are some great "crunch time" stories just begging to be told on this one! Still, I will be there on opening weekend if only for the thrill of riding a coaster that might not yet have all of its nuts and bolts fully tightened yet. Ha! Congrats to the workers who made this happen. I visited 5-6 times during it's construction and I never thought it would be finished by the deadline of May 23. I am glad I was wrong! May 22, 2009 at 10:28 PM · Ahh...I remember the Rattler. Not the neutered, tamed Rattler that has been reprofiled several times, but The Rattler in it's original state the first year it opened at Fiesta Texas. I was there on Fiesta Texas grand opening day (by sheer coincidence) as a lad. That was the very definition of intense. Six Flags hacked 80 feet and a twist off of the first drop in the years following. It's good to see Magic Mountain get some good reviews. The nice thing about this ride is that it's good even without the little bit of theme it has. SFMM could ride Terminator to great success this year. May 23, 2009 at 12:27 AM · Thanks for the correction, Derek. My apologies to GCI. I got my CIs mixed-up. Given that CCI was responsible for both Ghostrider and The Boss, I should never have mixed them up with the greatness that are the GCI woodies. Save for Gwazi which is a bit disappointing. May 23, 2009 at 11:51 PM · Looks like a very cool coaster. I was a little disappointed when I heard that it was Six Flags and not Universal that was building it. But, looks like Robert had a good time. May 25, 2009 at 6:01 AM · Btw, the trains on Psyclone were from B&M and one of the reasons the coaster faired so bad thruout the years. May 25, 2009 at 3:21 PM · Wow, that looks great. I thought there was supposed to be audio while on the ride? Was there any audio? It's a shame I'm in New Jersey. We have the IMO laughable Dark Knight Coaster, but nothing new this year. (I was allowed to ride TDN for free, but would have felt ripped off if I paid.) The pre show for TDN was great, but the ride was pretty bad. It looks like Terminator has a great preshow and a great ride.